Chapter 6 in The Innovators Mindset does use "traditional school"
While I would suggest this graphic read "Traditional School" and "Effective Learning," it is right on par with the shift we are making in both teaching and learning at Milan Middle School. Teaching and learning are on an instructional practices continuum that ranges from teacher-centered to student-centered. 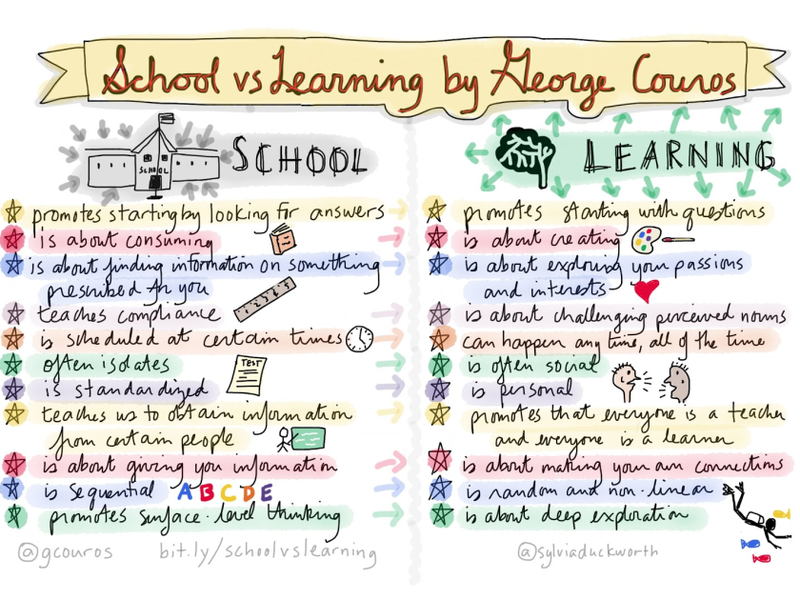 I would say that "school" has variations on that continuum and is not just one or the other. 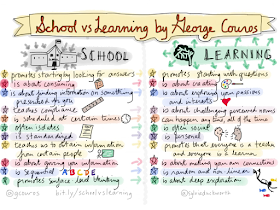 With the shifts in Common Core, 21st Century Skills, and Project/Inquiry-Based Learning, the first column in this graphic doesn't give all of these shifts and the work educators are putting into their practice enough credit. We need to shift our practices to engage our youth. Some of the best ways to do that are through student-centered approaches that allow students to drive their learning, demonstrate their understanding, and help them prove mastery of content in meaningful ways to the the student. This type of instruction is active for the students; it has a feedback loop; and it involves collaborating with peers and the teacher (as facilitator). Student-Centered Instructional Practice: “beliefs, actions, processes, philosophies, ways of doing things, and ways of making sense of the purpose of education based on the belief that the outcome defining successful teaching is what the student learned. Subsets within the learner-centered instructional paradigm include such practices as collaborative learning and active learning” (King, 2000, p. 8). 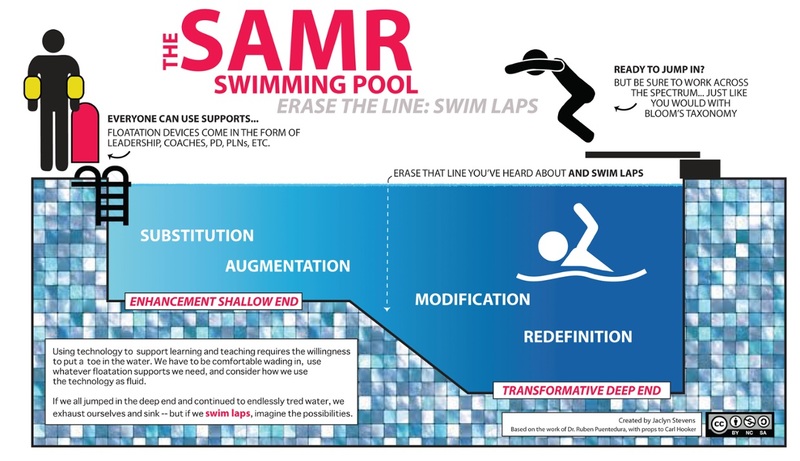 The "Learning" column in the first graphic is describing that student-centered instructional approach. Through my dissertation, many of Hubba and Freed's (2000) descriptors were supported as having an impact on changing teacher practice to be more student-centered. These included student feedback, treating students as sophisticated knowers, making learning intrapersonal and active, using the teacher as a coach or facilitator of learning, helping student understand what quality work is, making sure students understand application of that work, incorporating teaching and assessing, and using both general and subject-based skills. The LMS allows for teachers to expand on their approaches. We are just getting started, but it's about giving up control and taking risks.